Go to original pattern for design DROPS 137-35. Knitted DROPS slippers in ”Nepal” with edge in “Alpaca Bouclé”. Foot length: 22 - 25 - 28 cm / 8 3/4"-9 3/4"-11"
DROPS STRAIGHT NEEDLES size 5 mm / US 8 - or size needed to get 17 sts x 33 rows in garter st = 10 x 10 cm / 4'' x 4''. 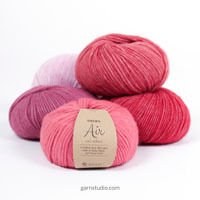 You can get the yarn to make this pattern from	13.00$. Read more. Worked back and forth on needle in garter st, i.e. K all rows. Cast on 37-41-45 sts on needle size 5 mm / US 8 with Nepal. Then work as follows: * 2 rows over all sts, 2 rows over the first 29-31-33 sts *, repeat from *-* until finished measurements. 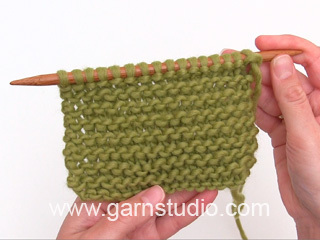 NOTE: Tighten the yarn a little extra when turning in the middle of row to avoid holes. Continue like this back and forth until piece measures 8-9-10 cm / 3"-3½"-4" (measured at the widest). 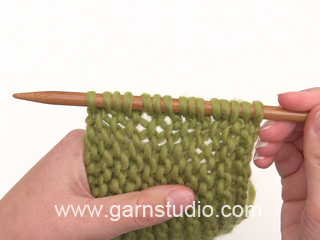 On next row from RS, slip the first 21-23-25 sts on a stitch holder (work them first) = 16-18-20 sts remain on needle. Continue as before back and forth over these sts until approx. 2½-2½-3 cm / 7/8"-7/8"-1 1/8" have been worked after sts were slipped on stitch holder (measured at the widest). Now cast on 21-23-25 new sts at the end of next row from WS = 37-41-45 sts. Continue back and forth as before until piece measures 8-9-10 cm / 3"-3½"-4" from where the new sts were cast on, loosely bind off. Slip the 21-23-25 sts on stitch holder back on needle size 5 mm / US 8, pick up 6-8-10 sts towards mid front of slipper and knit up 1 st in each of the 21-23-25 sts that were cast on, on needle size 5 mm / US 8 with 2 strands Alpaca Bouclé = 48-54-60 sts. Work in stockinette st back and forth, bind off when edge measures 6 cm / 2 3/8''. 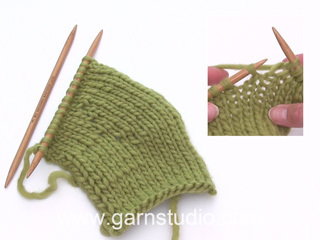 Pull a strand of yarn through the front loop of every st on the toe, tighten tog and fasten. Start at the end of the toe and sew the slipper tog edge to edge in the outer loop of the edge sts under the foot and continue up the back of the heel to avoid a chunky seam. Fasten the yarn tightly. Knit another slipper. 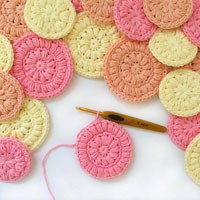 Dear Laura, here you can find the italian translation for this pattern. Feel free to contact us for anything you don't understand. Happy Knitting!